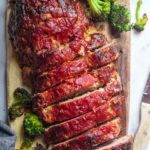 SUPER easy and extremely tasty, this low carb meatloaf is about to be one of your new family favorite recipes! Try making it as muffins for keto meal prep, or serve it sliced, you'll love it either way! Preheat to oven to 350 F and line a rimmed baking sheet with parchment paper. Mix the tomato paste, apple cider vinegar, erythritol, onion and garlic powder in a bowl and set aside. Alternatively you can use low carb ketchup. Heat the vegetable oil in a pan and cook onion with 1 teaspoon of salt and ½ teaspoon pepper over medium heat until softened (about 10 minutes). Add garlic and cook for another 1-2 minutes, or until the garlic is fragrant. Place cooked veggies into a large bowl and stir in Worcestershire. Add the ground beef, eggs, mozzarella and remaining salt and pepper and combine thoroughly. Form meatloaf on prepared baking sheet by forming a 5” wide loaf with your hands. Brush the ketchup over the top and bake in the oven for 1 hr, or until a meat thermometer inserted into the center reads 155F. This took my closer to 1hr 15 minutes, but start checking your meat at 1 hr to be sage. Allow the meatloaf to cool 15 minutes before cleaning up edges and transferring it to a serving plate*. Brush additional ketchup over the top (if you’d like) before serving and enjoy! *The melted cheese will make the baking sheet look messy! I always serve this on a clean dish. Sub the top 5 ingredients for low carb ketchup instead. Use less ketchup. You can also sub ½ the onion for celery. Nutritional information is based off 1 slice if you divide your meatloaf into 8 slices.